Mel Brigg with his hauntingly beautiful collection of paintings depicting his love of nature, animals and the wide open spaces of Australia and South Africa- as well as Laurindo De Abreu Soto with “Diversity”, his latest collection of exquisite sculptures- will be exhibiting at Brisbane based Red Hill Gallery from Friday 8 September 2017. South African born artist Mel Brigg has always said ‘I paint not because I want to, but because I must’. He has often been compelled to paint conveying his feelings and his message, as he believes painting is ‘a powerful way to make a statement about anything that moves you’. Drawing inspiration from the interior regions of Australia – the vastness and intensity of light, combined with the spirituality of the indigenous peoples – is a never ending source of subject matter for his work. Each of Brigg’s paintings is seemingly simple, yet highly skilled, and expansive in their vision. Laurindo De Abreu Soto describes his practice like life itself – a dynamic and ever growing entity, which moves back and forth in time and ideas. His work as a sculptor is closely related to design and architecture, and is consequently very “object based”. As a sculptor, his main concern and field of practice is Space, in which the work of art serves as a boundary that allows us to appreciate that space. The sculptures presented in this exhibition are a continuation of his exploration into the possibilities of materials – such as fibreglass, plywood, and Laminex – along with their combinations and interplay. Mel Brigg’s latest exhibition of emotive landscapes, and Laurindo De Abreu Soto’s collection of sculptures entitled “Diversity,” will open on Friday 8 September and continue until Sunday 24 September 2017 at Red Hill Gallery, 61 Musgrave Road, Red Hill, QLD. 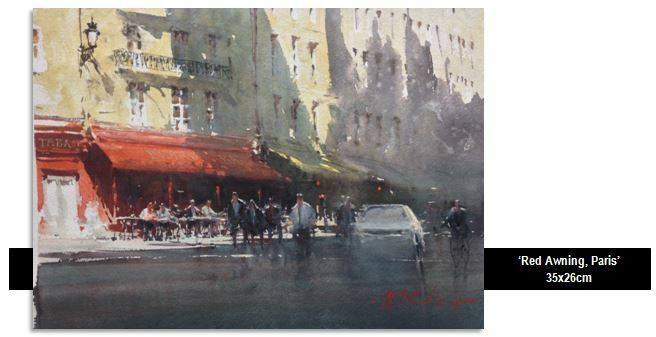 David Hinchliffe continues to make his mark in the art world with sell-out exhibitions across the globe in New York, London, Paris and his hometown, Brisbane. 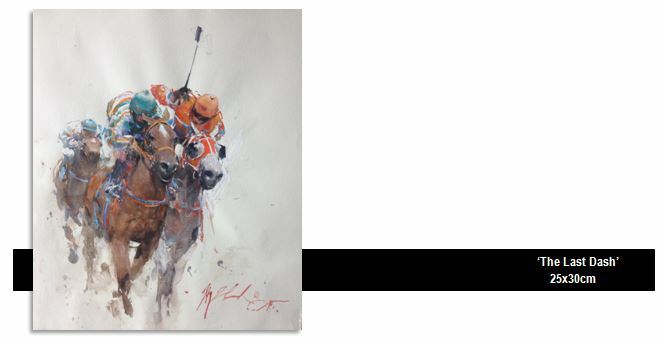 On Saturday 12 August, Red Hill Gallery will open its doors showcasing the latest collection of stunning paintings by Hinchliffe. David has always enjoyed the shapes, the noise and the shadows of city landscapes, as well as the seasonal colours of the ever changing landscape. Whether it’s the drama of the lower East Side in New York, the reflections in the canals of Venice, the romance of Parisian streets, the crowded pedestrian footpaths of Brisbane, or the breathtaking tree-lined streets near his home and studio. 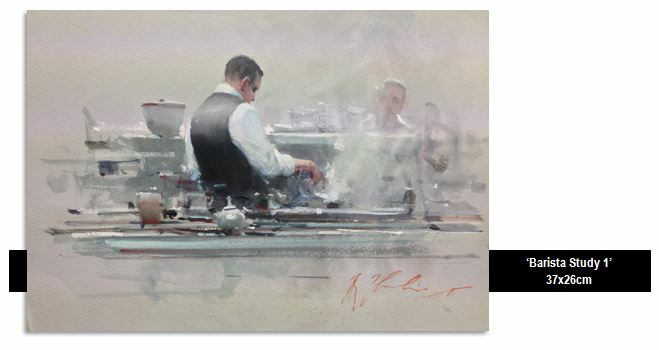 Red Hill Gallery is pleased to present this Major Solo Exhibition by Brisbane artist David Hinchliffe. Don’t miss this opportunity to see the artwork of this talented globetrotting Brisbane artist. “This exhibition follows many successful shows of David’s art all over the world. 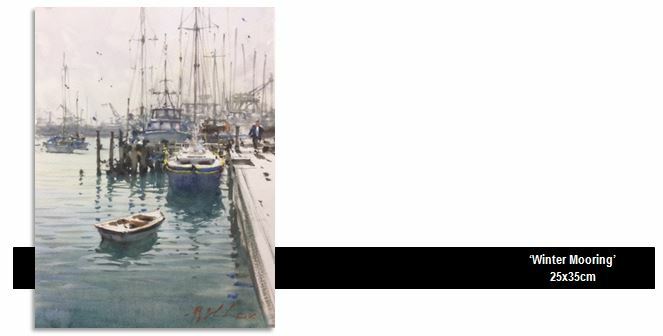 We are thrilled to show the people of his hometown, the incredible interpretations and atmospheric qualities that he manages to imbue in his canvases,” Gallery Director Margaret Campbell-Ryder said. Catching up with the lovely Katherine Wood is always a pleasure, and we were super excited to see her latest body of work for ‘In the Flow’ currently exhibiting at Red Hill Gallery, 61 Musgrave Road, Red Hill Brisbane. AC: You’ve added some new paintings to the gallery for this new exhibition, being works of different animals with a figure climbing. Can you elaborate on the symbolism of the hiking man? KW: Katherine’s Symbiosis series depicts the idea of working with your subconscious (the animal) and that through the power of ones mind, one can accomplish anything (the human). There is a natural force steering us; a desire, general energy or strong will. However, in most cases our subconscious mind stands in our way which produces doubt or negative thoughts. This ‘doubt’ depicted by the confronting animal is something we are forever trying to tame. Here the attention of the viewer is turned from the enormity of the animal (our fear) to the lone figure (confidently climbing and defiantly conquering it). Although we are small in the bigger scheme of things, if we choose to remain strong, harness our positive energy and thoughts and remain reflective and be in the moment then our ‘fear’ can be mounted and that we can achieve anything. 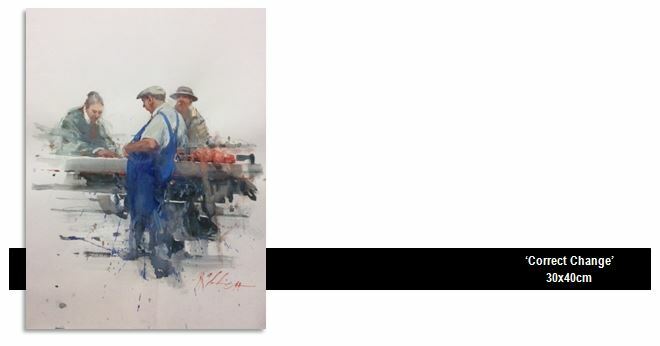 Each work is of a limited edition giclee reproduction of a worldwide distribution of 60 each. AC: The colour palette of some of the new paintings in the collection are soft and subdued. Was this to create a certain mood for the paintings? AC: Has moving from South Africa to Australia impacted the way you create art in a way you hadn’t initially anticipated? KW: Yes, definitely. In South Africa we lived in a small coastal town called Knysna. We renovated a gorgeous wooden cottage in a forest where my husband built my studio and both our daughters Satara and Meagan were born. Sadly last month Knysna was devastated by a fire, taking over 1000 homes in its wave of destruction. Our home of over 10 years being one of them. I feel subconsciously I am no longer afraid and that I am ready to embrace our life here. My work has definitely. expanded in relation to subject matter. Introducing the theme of the ocean (being the symbol of change) and that of the animal “symbiosis” series (with the idea of conquering your fear). My work since being in Australia has definitely. become more experimental and confident and I feel like there is still so much I need to learn and do. I am so excited for the future here in Australia and so grateful my daughters get to live in such an incredible country. AC: What piece of advice have you been given that’s been most helpful to you? AC: You often feature thick impasto textures in your paintings. What inspired you to create this theme in your pieces? AC: What is something about yourself that not many people would know about? 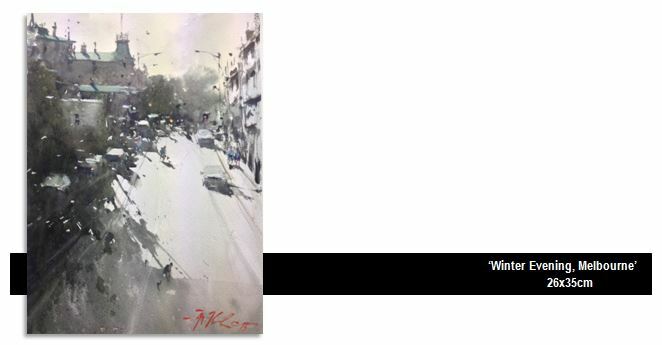 KW: When I started my art career over 20 years ago, I initially painted under a pseudonym of Thrianka Wood for over a year as a professional artist as I didn’t have enough belief in my work. “My mind used to poison me, but now it is my medicine.” I use to think I was a vehicle for my art but now I realise my art is a vehicle for me. Just in the simplicity and purity of using my art as a means from which to transcend from this reality. It is my meditation that becomes a product of my own pure energy. Working together we mutually benefit. The more I do it, the more in love with it I become and the knowing that I can tap into that space just by holding a brush is a very feel good space to be in. In allowing myself to consistently and consciously ask myself “how am I feeling” becomes my daily routine and through that a very rewarding living in the now. I am so grateful I get to make beautiful things and in an essence these allow me to create a beautiful life. Through art I have come to realise we are creators of our own existence, through painting my thoughts silenced and the oil becomes a voice for that of my silenced mind – a pure beautiful state of energy captured on canvas. AC: In your landscape works, we’ve noticed a pattern of a little tree or man somewhere in the painting. What does this represent to you? By paying more attention to nature we are able to become more conscious. By being in nature we are able to step outside of ourselves -ultimately we are just an extension of it. We are not separate. If we don’t do this we become engulfed in our ego. The ego is driven by many human emotions to name a few; shame (feelings you are less than), guilt (feeling you need to repair something), envy (wanting to destroy) and jealousy (wanting to compete). We need to conquer these to ultimately achieve happiness. In this body of work “In the Flow” Katherine reflects an ideal that allows us as individuals to contemplate a place of no self. AC: What is it about the ocean that excites you and influences your paintings? KW: There are so many aspects to the ocean that are exciting. Its daunting width and depth, simply stands for life itself. It may be quite calm, but it can become raging and even deadly in an instant, with the waves representing the sudden obstacles life throws our way. I love the oceans calm presence and sense of space, a place to reflect on the past, and to dream and hope about the future. A place to look ahead and imagine what could be waiting on the horizon, actually or metaphorically. The sea can mirror our mood, as if it knows we are feeling sad, despondent and bleak. Or as if it knows we are full of rage and fury. Or as if it knows we just need to be seen and to be heard and to be in the presence of another. The ocean has become one of my favourite symbols since moving to the Sunshine coast. It is a symbol to represent life and its hardships. It stands for the soul, the subconscious, emotion, nature, a primal state, nature, the “good” parts of existence, dreams, fantasy and more. Alternatively different from portraying a peaceful ocean. I use the imagery of the ocean to portray the inner conflict of a person; and the image of the stormy ocean, the high, crashing waves represent overwhelming emotions, that threaten to “drown” the person. The beach symbolises the meeting between your two states of mind – the rational (Sand) and the emotional (Water); or the place of transition between your physical self and your spiritual self. And even so the “threat” of the looming wave seems so real the silhouette of the man confidently, calmly walks on. Taking anchor in the peace of one’s mind and so reflecting on the idea that if one can find control of your thoughts so can you find control over any of life’s hardships. The ocean also represents the subconscious, the unknown parts of the mind, the dark, hidden depths of the ocean standing for unknown, unexplored thoughts, emotions, feelings, that are not visible on the surface. 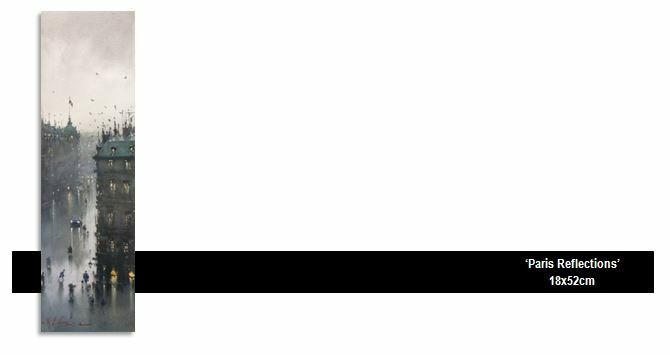 it’s a symbol for the person facing his own subconsciousness, going deep into his own emotions and his mind. The ocean also stands for the soul. The tranquil, inner part of oneself, that lies at the core. The images of the still, Deep Ocean represents the deepness of the soul. What I find to be the most important parallelism between the sea and life in general is the unpredictability of both. A sudden change in weather brings upon giant waves that make it impossible to swim forward, and the only solution is to go back to shore, much like a sudden obstacle in life makes it impossible to move forward and the only solution is to go back a few steps. The point of course is to not give up, and keep going, even if ultimately it doesn’t give you what you worked so hard to achieve. A wave is unstoppable, a force of nature that sweeps over everything in its path. It indicates strength and inevitability, but also a lack of thoughtful discrimination and futility of resistance. The sea as is water is fluid and can slip through one’s fingers, refusing to be grasped. Similarly, so is life; impossible to contain and clearly define. To me the ocean represents the idea that for one to move forward we need to master the idea of persistence (that this life is not discriminatory) but that we need to keep trying. Katherine Wood’s current collection of artwork is on exhibition at Red Hill Gallery, 61 Musgrave Road Red Hill, Brisbane until Sunday 30 July 2017. Make sure you visit the Gallery and its amazing team. After completing a four week residency in Vallauris , France and returning to Australia, we at ArtChat were fortunate enough to catch up with Leading Australian Ceramist Bill Powell and discuss all things clay in preparation for his exhibition “Stretching Potential” at Red Hill Gallery. AC: The ceramics in your current exhibition at Red Hill Gallery are stunningly different from the pieces in your last show. What inspired you to change techniques? AC: What challenges did you face creating this series of pottery, and how did you overcome them? BP: The greatest challenge has been translating this technique into our available Australian clay bodies. In this exhibition I have used six or seven separate clays from varied sources and all with their own peculiar characteristics. Gaining an understanding of each one and how to get the best out of them has been a journey of trial, error and revelation, a process that I find both enjoyable and rewarding. AC: When you’re not creating, what do you enjoy doing in your spare time? BP: Potting can be a very physical activity and places stresses on the body. I have formed a lap swimming habit that helps maintain a level of physical health and also promotes a mindfulness that I find beneficial. I also enjoy photography, travel, and writing and, when I have a chance, playing guitar. Sadly, spare time has been very rare lately. AC: Did your time in Vallauris, France influence the way you created these vases? BP: It was during my time in Vallauris that I first attempted this stretching and layering clay technique. I was introduced to the local dark manganese clay bodies and pure white porcelains of the local area and decided to combine the two. Interestingly the results have more to say about our Australian landscapes than any direct French reflections. So often we see what is right in our own backyard far clearer from a distance. AC: Do you have plans to travel for your art research again? BP: I currently have no specific plans for further research travel but I do harbour desires to visit either Japan or China or both if possible. Both countries have well developed traditions in ceramics and a history that is both alluring and intriguing. Specifically the Porcelain works of China. AC: How long did it take you to develop your wheel throwing skills? BP: I have been throwing on the potter’s wheel since my first encounters with clay. That was back in the late 70’s. My skills are all self taught and have been greatly improved by many decades of production throwing. In fact I still throw production two days a week, along with teaching and running workshops in my techniques. AC: If you could invite any artist in history over for dinner, who would it be and why? BP: There are so many. If I can only have one and I could overcome the language barrier, then I think I would like to share the time with Spanish maestro Antoni Gaudi. I admire his visual intelligence and unique designs but most of all , I would like to gain an insight into his mindset and how he was able to swim against established schools of design and confidently forge a vision that is both outstanding and awe inspiring. AC: What do the vessels in this exhibition represent to you? BP: I have an overall perception of this body of work as a metaphor for personal development. I have explored multiple varied clay bodies and created each piece from the inside out. With this sodium silicate technique, the outer surface is stretched to within its breaking point. The risk is that the internal pressures when forming the shape can, in fact, go too far and tear, leaving the pot unrecoverable. The final result reflects these stresses and is evident in the textured surfaces. Much like life’s personal pressures that we all bare and internalise and which form our characters from within. After all, there is very little personal growth to be achieved from the sanctuary of our comfort zone. Bill Powell’s current collection of glazed and unglazed ceramics are on exhibition at Red Hill Gallery, 61 Musgrave Road Red Hill, Brisbane until Sunday 30 July 2017. Make sure you visit the Gallery and its amazing team. On Saturday 10 June 2017 Australian Figurative artist John Maitland returns to Red Hill Gallery, Brisbane with his latest exhibition “The Thin Black Line”. Maitland’s skillfully executed oil and acrylic paintings are informed by figurative expressionism and imbued with rigorous colour and texture to denote emotive nuance. The artwork achieves poignancy through a unique perspective which resonates throughout his cohesive presentation. Maitland’s innovative style is created and conceived outdoors, exposed to the elements and the extreme heat of the sun. The built-up layers in his paintings are encouraged to crack and fissure giving an aged appearance resembling archaic surfaces. 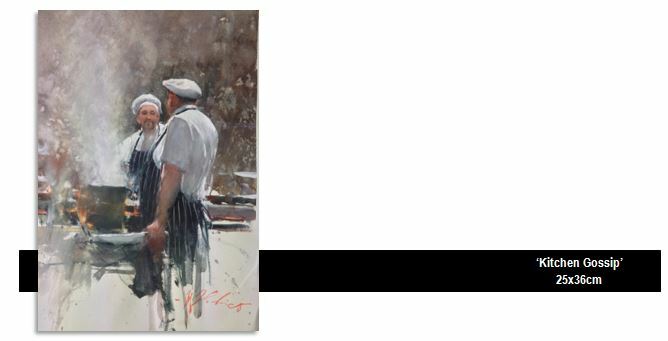 Broad, sweeping brushstrokes and the strength of his paint application give rawness and beauty in an understated way. John Maitland’s Exhibition ‘The Thin Black Line’ will open on Saturday 10 June and continue until Sunday 25 June 2017 at Red Hill Gallery, 61 Musgrave Road, Red Hill, QLD. A passionate love of the landscape drove Piers Bateman to paint his beloved country from the heart of the red centre to the coastal scrubland; quintessential Australian images. In September 2015 Piers Bateman tragically died in a boating accident off the coast of New South Wales, a sad loss to the art world within Australia and Internationally. On Friday 12 May, Red Hill Gallery, Brisbane will open its doors for the Exclusive Retrospective Exhibition of Bateman’s artwork. Piers Bateman undertook several trans-Australian painting expeditions, bringing us the vivid paintings of remote Australian landscapes for which his work is known. He featured in over sixty major solo exhibitions throughout his lifetime, both in Australia and aboard. His artwork hangs on the walls of the Reserve Bank of Australia, Melbourne University and the conference room in the Australian Embassy in Washington, to name just a few. An avid adventurer, Bateman travelled abroad often to sail and paint in areas such as the Greek Islands, the Mediterranean, and much of Europe. Bateman had the knack to make a home wherever he found himself. He was invited as the Australian representative at MAC 21, a contemporary Arts Fair in Spain and later in China, was offered and accepted a position at the Shanghai Institute of Visual Art (S.I.V.A.) as an Honorary Professor. Prior to this, the Australian Embassy in Washington hosted a large collection of Bateman’s Australian works. The Piers Bateman Retrospective Exhibition will open on Friday 12 May and continue until Sunday 4 June 2017. On Friday 12 May, Red Hill Gallery will open its doors to ‘Limitless’ the latest exhibition by Todd Whisson. For Whisson, painting is in his blood. Son of esteemed artist Eric Whisson, this Brisbane artist gave up his job as a professional framer in 2003 and turned his talents to the canvas fulltime. 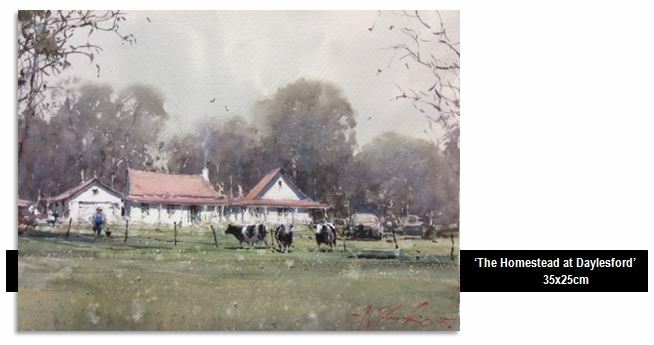 In recent years Whisson has also taken up formal study in the arts and his style has since evolved. 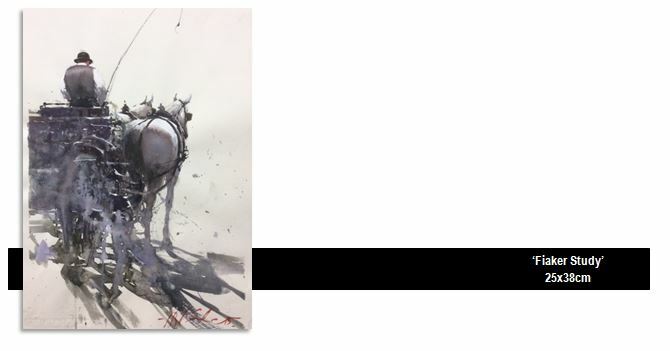 His recent work has developed markedly, taking an abstract approach which continues to reflect his skill in traditional techniques yet has enabled him to communicate more than a visual representation, and has elevated his passion and vision to another level of skill and perception. 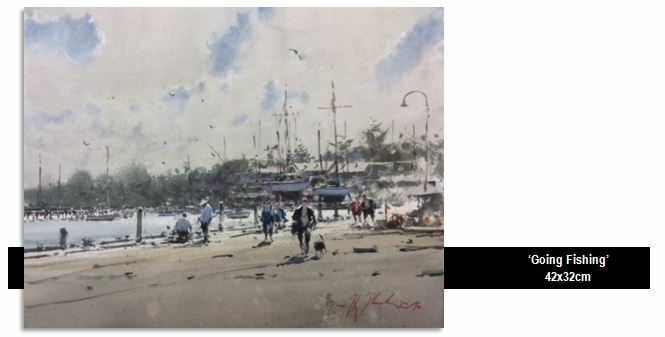 Whisson applies a “en plein air’ style of painting to the spectacular coastal and landscape scenes of Queensland. 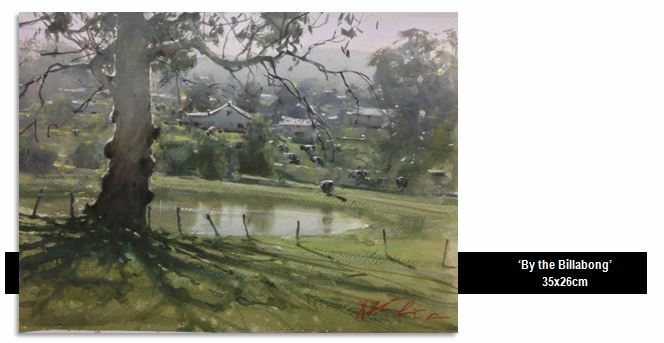 His ability to balance light with shadow captures the ambience of the Australian Landscape. 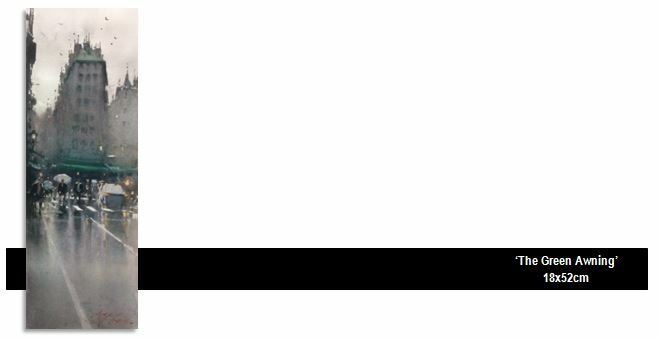 Limitless is exhibiting at Red Hill Gallery, 61 Musgrave Road from 12 May to 4 June 2017. Combining interior, urban and country landscapes, ‘Treasured Places’ showcases the colourful world that artists live in and are inspired to paint. Nick Olsen, Tim Graham and Ken Strong take us on a journey through time and place, with their interpretation of life around them. ‘Treasured Places’ opens on Friday 7 April 2017 at Red Hill Gallery in Musgrave Road and is sure to attract art lovers to view the much loved icon scenes of Brisbane and surrounds. Brisbane artist, Nick Olsen’s colourful and evocative landscapes relate to an expression of a sense of place. He likes to focus on images of the simple things in life, hoping these subjects allow the viewer to relate to their own experiences. He believes this is an important aspect of enjoying art. 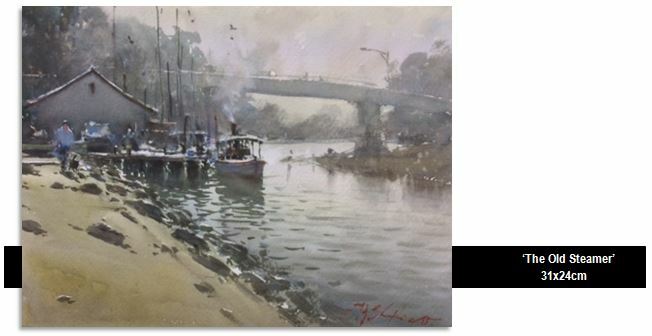 Tim Graham started painting at an early age and currently resides on the Sunshine Coast. He paints in an impressionist style where his main emphasis is colour. “I look out the studio window into the garden and trees and everything is full of sunlight and the brightest of colours, it all looks so happy and full of life’’. 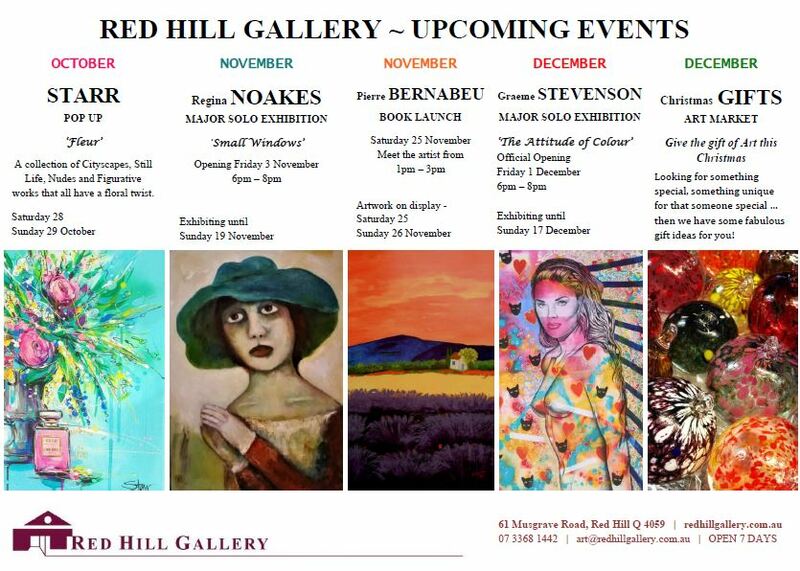 Starting the exhibition calendar for 2017 at Red Hill Gallery, ‘The March Collection’ features a selection of artwork to entice Art lovers and collectors alike with a kaleidoscope of paintings especially curated for this event. Officially opening on Friday 3 March 2017, the exhibition will feature artwork by eight individually talented artists. Michel Canetti is acclaimed as one of France’s leading fashion illustrators. As a prestigious French artist and illustrator, he has worked with some of the world’s largest fashion houses and magazines. Canett’s creativity deals with his insight into fashion and the appeal of the female charm, visible in each of his breathtaking paintings. John Harmon has a reputation that precedes him, having worked in house for both Warner Bros. and Disney as an animation background painter and exclusively as a freelance illustrator for Walt Disney. 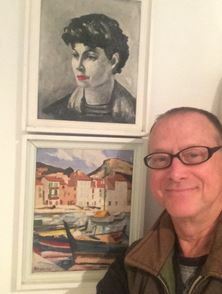 An accomplished fine artist, Harmon has explored his own unique and quirky style in the art world. 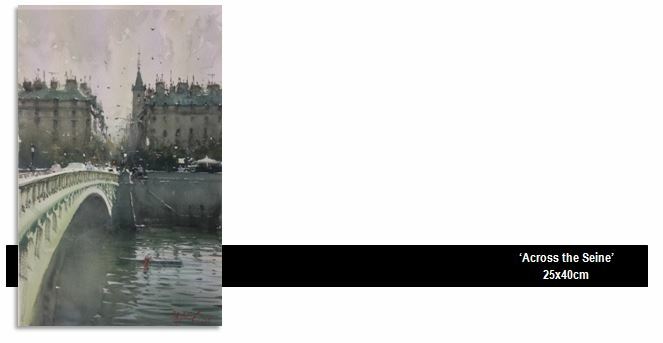 Drew Gregory is represented internationally and has won numerous prestigious national Art awards. He is an artist at the peak of his career with a deep understanding and love of his subject matter. His Australian landscapes are inviting and addictive, transporting you to another world far away from the bustle of city life. 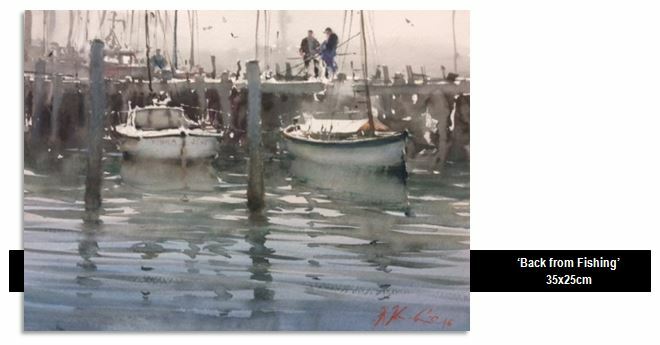 Joining them will be five of Red Hill Gallery’s highly regarded painters. Australian landscape watercolour artist Ruby Eaves; representational oil painter and dry media artist Jeff Gant and landscape and fauna artist Carole Foster with her paintings of cheeky birds; John Turton is a colourist who paints vibrant impressionistic landscapes and Louis Dalozzo’s bold paintings reflect his love of the land surrounding the Kimberley’s. Chinese New Year, known in modern Chinese as the “Spring Festival” in Mainland China, is an important Chinese festival celebrated at the turn of the traditional lunisolar Chinese calendar. Celebrations traditionally run from the evening preceding the first day, to the Lantern Festival on the 15th day of the first calendar month. The first day of the New Year falls on the new moon between 21 January and 20 February. In 2017, the first day of the Chinese New Year is on Saturday, 28 January, initiating another year of the Rooster. People pray and wish for good harvest on this auspicious day and prepare for the farm work ahead that starts soon after the new year. It’s a long 7 day celebration and public holiday is observed for the whole week. The 12 zodiac animals in the Chinese zodiac cycle are – the Rat, Ox, Tiger, Rabbit, Dragon, Snake, Horse, Goat, Monkey, Rooster, Dog, and the Pig. Roosters are Energetic, smart, hardworking, trustworthy and brave people. Get into Red Hill Gallery and find yourself a Rooster today. Red Hill Gallery presents the talents of four diverse leading ladies for their final exhibition for the year. Collectively their creative artwork is innovative and refreshingly evocative. The exhibition “Kaleidoscope of Colour” opens at Red Hill Gallery on Friday 2 December 2016. Christine Reilly is a respected and imaginative Queensland artist, who strives to portray her evocative images with colour and movement, making them come alive on the canvas. 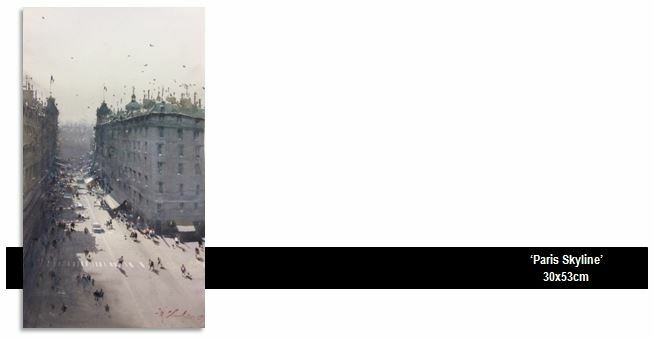 Her work demonstrates a long-held love of travel, people-watching, local city scenes and beachscapes. It chronicles not only the progression of her subjects and style but also her own journey as an artist and woman. Larissa Blake creates vibrant and energetic works inspired by the everyday, her love of travel and interiors. Larissa was exposed to Art from early childhood through her mother, professional artist, Loretta Blake. Her work references the domestic and feminine domains in a celebratory context, using an exuberant, joyful, uplifting colour palette. Loretta Blake whose passion is classic art, has had a distinguished career in Australia and overseas, working in oils as well as water based paints. Flowers, a first love of subject matter, gradually gave way to the exploration of people and landscape, whilst still expressing vibrancy and spontaneity. Karen Atkins is constantly amazed by possibilities, enormous skies, sumptuous colours and extraordinary relationships between people, animals, land and art. Karen’s paintings evolve from experiences and observations and explore, with romance and whimsy, the places our choices may take us. 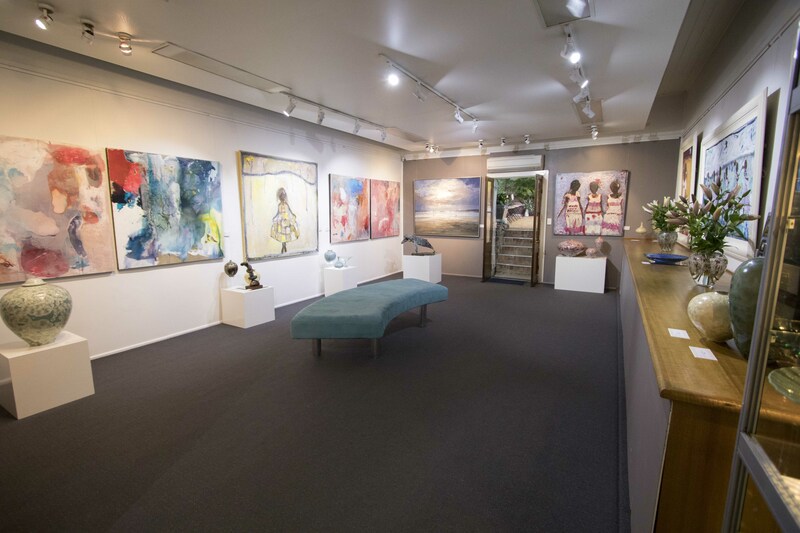 Throughout the year Red Hill Gallery has been celebrating its 30th Anniversary and on Wednesday 31st August the gallery presented its major Anniversary Exhibition of Excellence. A number of successful artists, many with International reputations, will be exhibiting including Jamie Boyd, Mel Brigg, Regina Noakes, John Maitland, David Hart, Conchita Carambano, John Beeman, Bill Powell and Dean Rusling. 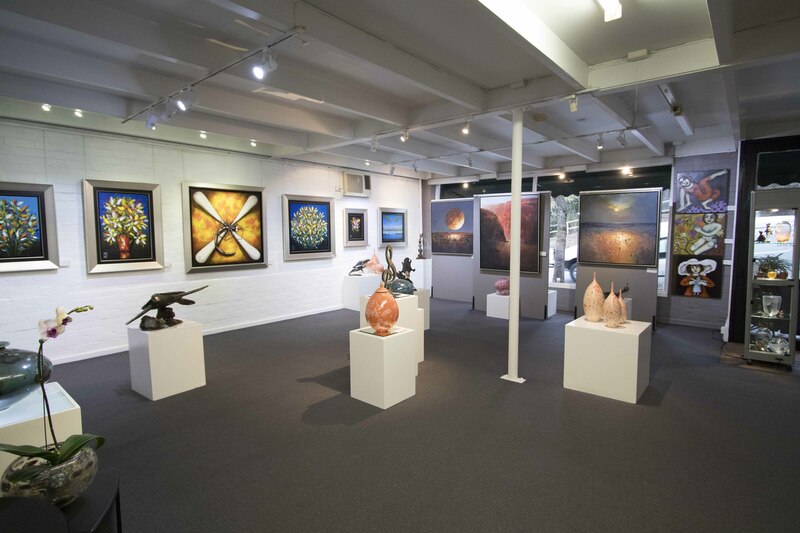 Since first opening its doors in 1986 the Red Hill Gallery has remained at the same premises, 61 Musgrave Road, in a building over a century old which has become a part of Brisbane’s historical fabric. The property was built in the early 1900s by the Whitehouse family to house their famous organ business, supplying organs to most city halls, civic buildings, churches and cathedrals throughout Australia and New Zealand. It subsequently became the home of many other businesses including a confectionary manufacturer, a sound studio and a printing press. For the last 30 years, thousands of paintings, handmade glass, sculptures, jewellery and ceramics have been purchased from this quaint little ‘red’ building with the green awning on Musgrave Road. With highly-successful careers in the retail and marketing sector, Graham and Margaret Campbell-Ryder purchased the gallery in 1998. 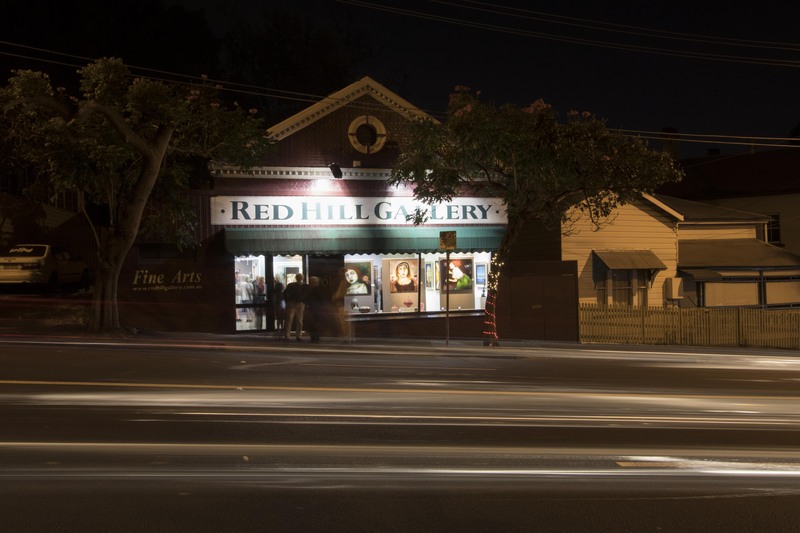 According to Mr Campbell-Ryder the Red Hill Gallery’s longevity and success is due to many factors however one of the most crucial ingredients has been customer service. “Regardless of what business you’re in, if you don’t provide excellent service from start to finish then you won’t stand the test of time,” Mr Campbell-Ryder said. Seeing art in the flesh is an enriching experience, there is colour, beauty, passion, thoughtfulness and intensity in art that is soothing to some and exciting to others. It’s an experience that should be enjoyed by all. 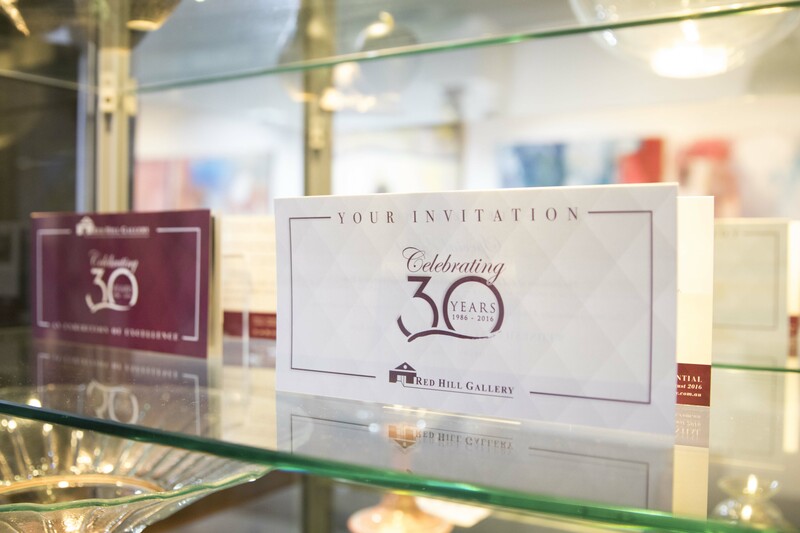 “At Red Hill Gallery we look forward to continuing the tradition of providing excellent customer service and welcoming clients to the gallery during our 30th Anniversary celebrations and for many years to come” said Margaret Campbell-Ryder. The 30th Anniversary Exhibition officially opens on Wednesday August 31 at 6pm and continues daily until 25 September 2016. 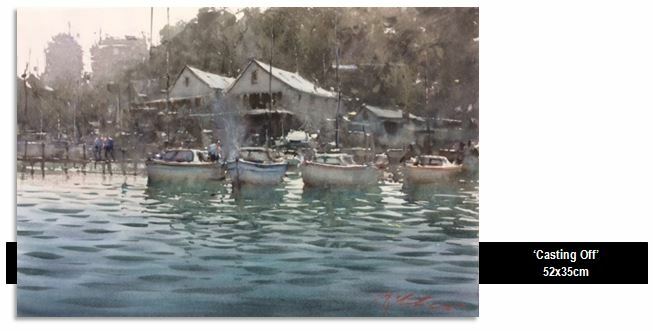 ArtChat recently spent 5 minutes with Brisbane artist David Hinchliffe, to discuss his upcoming exhibition and recent trips overseas. 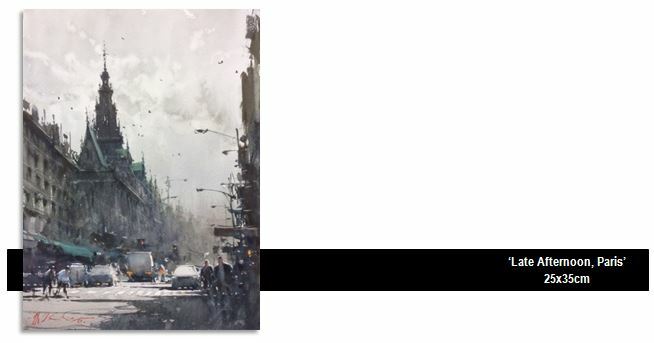 His latest exhibition at Red Hill Gallery features the energy of New York City, the chaos of Havana, the romance of Paris, together with the architecture of London and iconic Brisbane landmarks. AC: What’s your philosophy about art? DH: Art doesn’t change the world, my opinion however, it does change the way we see the world. That’s my job as an artist: to help people see the world. AC: You have painted so many different parts of the world, do you have a favourite location to paint? DH: I keep finding new places to paint, in addition to my regular painting visits to New York, London, Paris, Sydney and Melbourne. I’ve just come back from running a painting workshop in Bali and that was special. But I have to say the more exotic destinations like Marrakech and Fez in Morocco and Havana in Cuba are still my favourites…along with Brisbane of course. AC: We loved the photos of your recent trip to Bali, can we expect to see some of your Bali paintings in the near future? DH: Absolutely. I especially loved the Balinese people and culture, I’d never been to Bali before. I guess I was put off by so many Australians going there. But I was surprised to find most of the people hadn’t been corrupted by the commercialism and tourism that has swamped a few parts of Bali. It was painting the people that I really enjoyed most, partly because my first love is figurative painting and partly because the people were so lovely and willing to be painted. 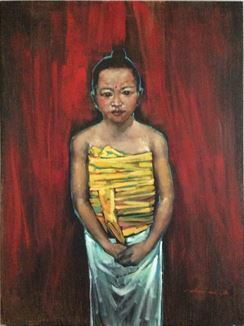 (See pic of Balinese girl at Candidasa.) I’d be delighted to share those paintings in the months ahead. 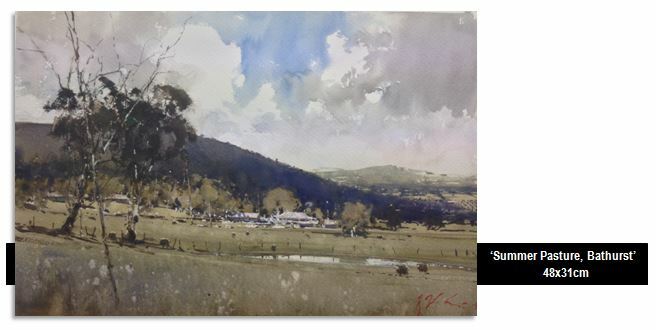 AC: It has been hinted that there is going to be a double David Hinchliffe exhibition in the future, can you tell us more? DH: It all started a few years ago when there was some internet confusion about David Hinchliffe artist (Brisbane) and David Hinchliffe artist (Somerset UK). I got in touch with the U.K. David and he and his wife Patsy invited me to their home and studio in lovely Somerset. 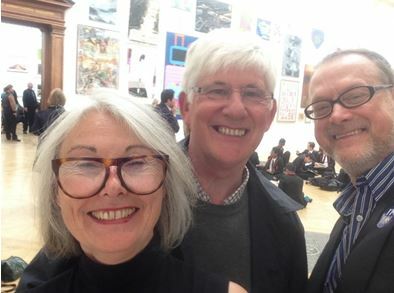 That was about 4 years ago and the friendship has grown and each year we visit the Summer Exhibition at the Royal Academy. (See pic.) We even have very similar painting styles, although he has an OBE after his name! 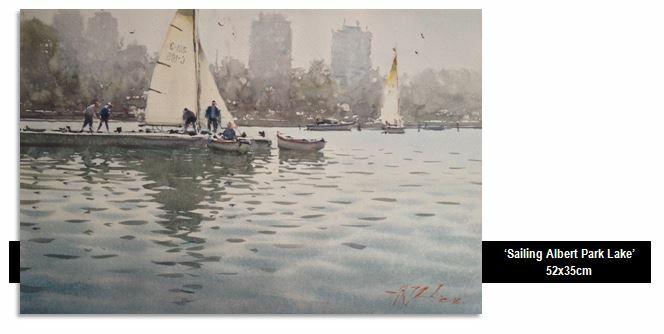 I’ve invited him and Patsy to Brisbane and I’m hopeful that might result in a joint exhibition — “Two David Hinchliffe’s are better than One” is the working title! AC: What do you like most about the Luxembourg Gardens? DH: Luxembourg gardens in Paris has been attracting artists for 2 centuries, particularly the impressionists at the end of the 19th century. It’s just down the road from the Pantheon and near the Sorbonne but its attraction is the relief it offers to the local built environment. I love the cafe in among the tightly planted rows of trees on the Pantheon side of the park where the local head waiter terrorises customers. I know him now and I know his gruff wiles and ways, so I enjoy observing how new patrons respond to his very Parisian style of ‘waiting’. I’ve sat at that cafe many times painting the dramatic light and shade and the shapes of people moving in and out of those regimented rows of trees. 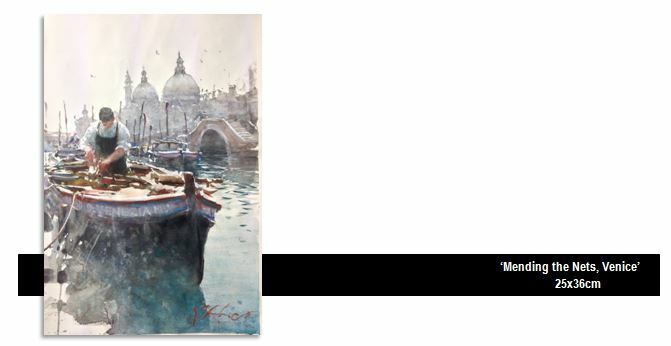 AC: In your current exhibition you have a small number of paintings (for example Marrakesh) that are different from you usual style, can we expect to see more of this? DH: My ambition as an artist is to try to capture the personality of the cities I visit. No two cities are alike. Parts of some cities might resemble parts of others, but I hope I am able to reflect their individuality in slightly different styles. AC: What style of art do you personally collect? 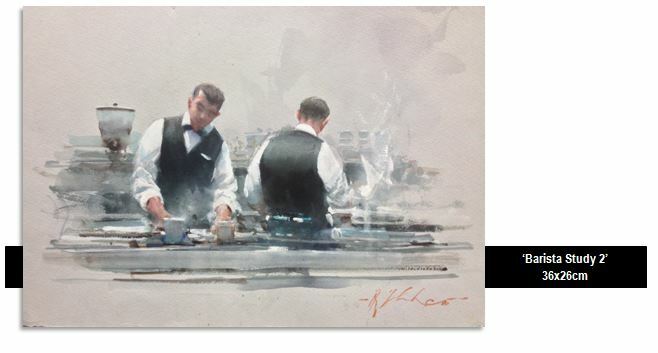 AC: What was the lightbulb moment that made you switch from politics to painting fulltime? DH: It wasn’t so much a ‘switch’ as a ‘reprioritising’. I’ve been painting continuously since I was a teenager including on my holidays when I was in politics. That’s how I was able to have more than 60 exhibitions by the time I retired. I’d had enough of politics and the dumbing down that has been an increasing feature of political discussion. I’m now lucky enough to have had just over 4 joy filled years of uninterrupted full-time painting, undisturbed by the madness or mediocrity of politics. AC: Having travelled and exhibited all around the world, why do you call Brisbane home? DH: No matter what great times I have painting in extraordinary parts of this world, I have never returned to Brisbane wishing that that I’d stayed longer in the city or cities I’ve been visiting. I always return with a sense of gratitude that I belong to such a special place with such good sub-tropical weather, magnificent parks with Poinciana’s and Jacarandas, its unique traditional Queenslander architecture, and incomparable coffee! 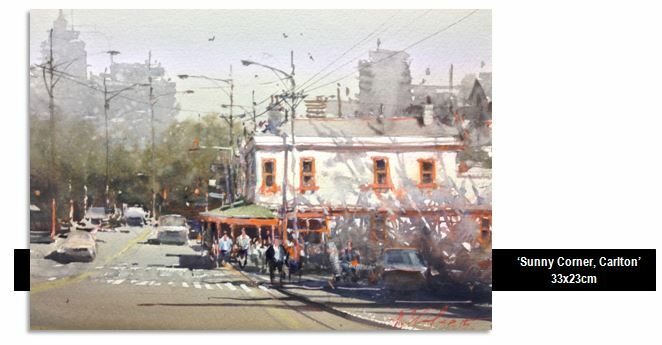 David Hinchliffe’s current collection of artwork is on exhibition at Red Hill Gallery, 61 Musgrave Road Red Hill, Brisbane until 21 August 2016. Make sure you visit the Gallery and its amazing team. KY: Love of the planet and life. AC: Have you had any noteworthy experiences with any creatures portrayed in this latest collection? KY: The first time I went to the beach and braved the ocean in Australia, I was stung by a Blue Bottle. AC: If you weren’t an artist, what career would you be pursuing? AC: What inspires your artwork? KY: It takes time to really look at what’s surrounding us to admire our life; this new body of work is just like a time capsule. You have to freeze time to really look at what is happening in the world around you. AC: The detail in this latest collection is mind-blowing, roughly how long does each piece take. Does it vary depending on size or the creature you are creating? KY: Every day is a different day, it all depends on my feeling and how motivated I am. AC: If you could be a creature, which one would you be and why? AC: In the past, you have likened the experience of engraving to a zen-like meditation, do you still feel this way? KY: For me, it has always been like this. I feel like I am working in a bubble. You need motivation to work and you need to get excited about what you are making. AC: What inspired you to engrave glass? Do you draw your idea first? KY: I wish I could, but I am not good with drawing, so I just look at glass and start to engrave. AC: First it was trees, now it is creatures, what will come next? “Creatures” an exhibition of amazing etched contemporary glass by Kayo Yokoyama continues at Red Hill Gallery, 61 Musgrave Road, Red Hill, Brisbane until Sunday 24 July 2016. I have been travelling to Dordogne for some years now and have become a familiar figure at this market place. I got to know some of the locals and shared their everyday moments. This lady was one of those difficult customers and I had to laugh at Jean-Luc watching her dole out the precise amount of coins for just the one tomato she did buy! After she left he turned to me and said she made his life a misery every time, but he liked her and looked forward to seeing her, without her it would be just another boring day at the market. Smart man.